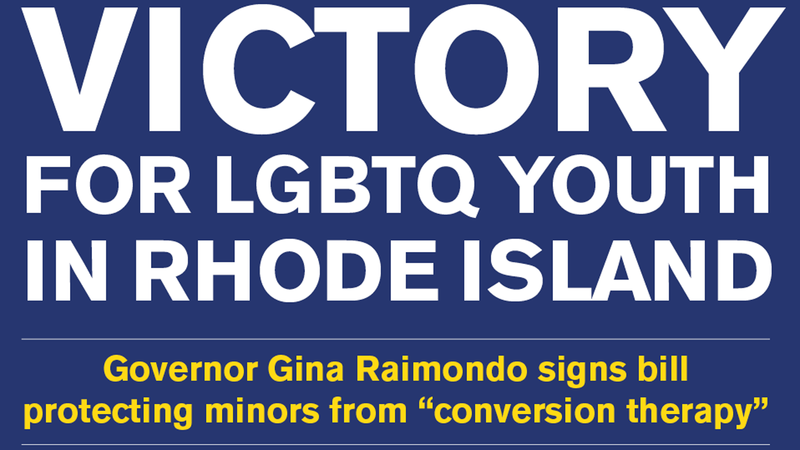 Rhode Island is now the eleventh jurisdiction — and the fourth state so far this year — to enact these crucially important protections. Connecticut, California, Nevada, New Jersey, the District of Columbia, Oregon, Illinois, Vermont, New York, and New Mexico all have laws or regulations protecting youth from this abusive practice. A growing number of municipalities have also enacted similar protections, including cities in Ohio, Pennsylvania, and Florida. “Conversion therapy,” sometimes referred to as “sexual orientation change efforts” or “reparative therapy,” encompasses a range of dangerous practices that seek to change an individual’s sexual orientation or gender identity or expression. These practices are based on the false premise that being LGBTQ is a mental illness that needs to be cured — a theory that has been rejected for decades by every major medical and mental health organization. There is no credible evidence that conversion therapy can change a person’s sexual orientation or gender identity or expression. To the contrary, research has clearly shown that these practices pose devastating health risks for LGBTQ young people such as depression, decreased self-esteem, substance abuse, homelessness, and even suicidal behavior. The dangerous practice is condemned by every major medical and mental health organization, including the American Psychiatric Association, American Psychological Association, and American Medical Association. HRC has partnered with the National Center for Lesbian Rights (NCLR), GLBTQ Legal Advocates & Defenders (GLAD), and state equality groups across the nation to pass state legislation ending conversion therapy. More information on the lies and dangers of efforts to change sexual orientation or gender identity can be found here.